3C Plumbing is a family-owned business. We serve the local communities of Carmel, Castleton, Fishers, Fortville, Lawrence, McCordsville, Noblesville, Westfield, Zionsville and the north side of Indianapolis. We repair and install all major brands of water heaters, both gas and electric. We will repair your water heater whether or not it is still covered by a manufacturer’s warranty. If your water heater is no longer covered by a warranty, we will honestly advise you about the short-term and long-term benefits and economics of repairing an old unit compared to replacing it with a new unit. Many water heater repairs fix the problem, such as replacing the heating element or the thermocouple, but an older unit no longer covered by a warranty is likely to have other problems not too long after the repair. A water tank that is leaking cannot be repaired. Cy Cadwalader repairs and installs gas and electric water heaters at a price the “Big Guys” can’t touch. No mark up on the cost of the equipment we provide means that what we pay for the water heater, you pay for the water heater. We stock and recommend Ruud Professional Water Heaters. Ruud is the first name in water heaters, literally. The world’s very first automatic storage tank gas water heater was invented around 1889 by Edwin Ruud in Pittsburgh, PA.
Today, the The Ruud Manufacturing Company is the division of Rheem that manufacturers water heaters available only through professional plumbers like 3C Plumbing. Ruud offers a large selection of gas water heater models from the most energy efficient models on the market today to sleek and sturdy models that offer the essential features required by homeowners who want great quality and ease-of-ownership. Models are available with 40 and 50 gallon capacities and flexible venting options up to 100 feet. Ruud also offers electric water heaters engineered for longer life and greater energy efficiency. New gas water heater with 50-gallon tank installed for $925, including labor for most installations. 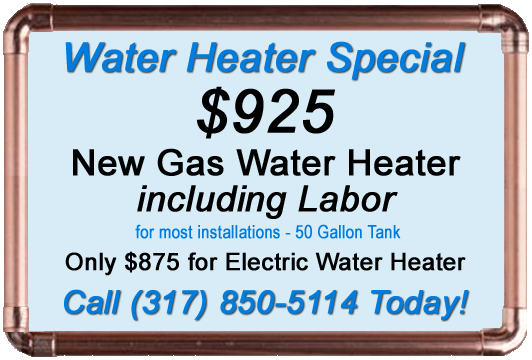 New electric water heater with 50-gallon tank installed for $875, including labor for most installations. If you need a water heater repaired or replaced call (317) 850-5114, or send us an email, or submit the form below for prompt, reliable service.